My first post, and my first piece of clothing. Well technically you could call it an accessory. Since I have absolutely no late 1700's items of clothing, I'm starting from the inside out. Technically the first thing I made was my chemise, but i'll be showing that in a later post with the stays. 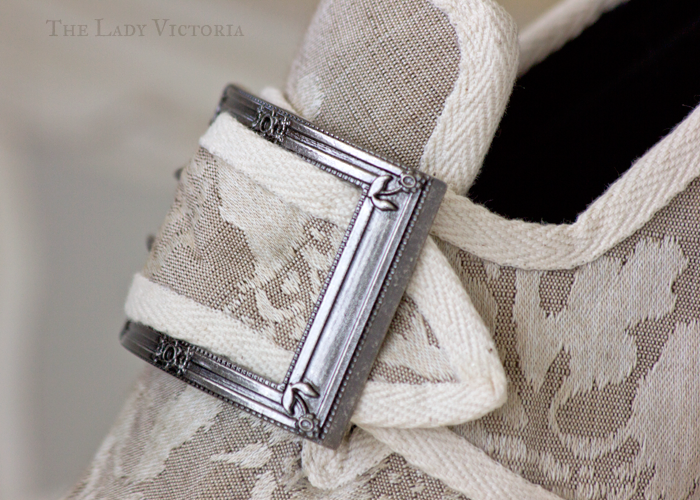 After making the chemise and researching other aspects of 1700's undergarments, I became enamored with garters. 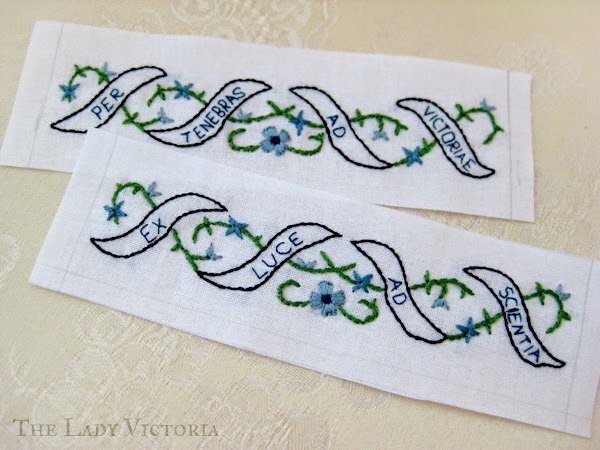 Something about the delicately embroidered mottos, wrapped around the knee with flirty ribbons was enchanting. I have also always loved Before the Automobile's steel sprung garters, and many of the later extant examples that use springs. 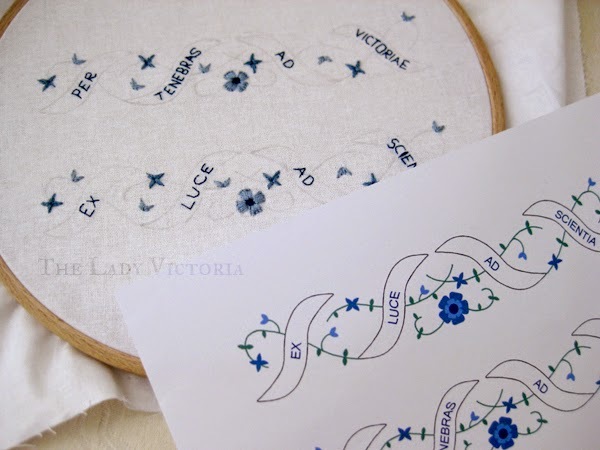 I based my embroidery design off this example. MFA - 18th Century. Silk satin with silk tambour-work and silk fringe. Unfortunately mine aren't silk, just some white cotton that I had left over. 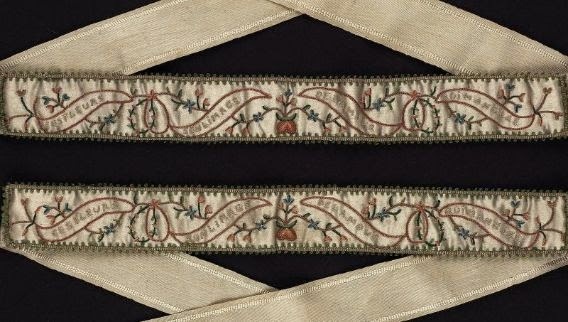 The embroidery was done with cotton floss. The motto is Latin, instead of the usual French or English ones found on surviving examples. The top reads "Through darkness to victory" while the bottom reads "From light comes knowledge". 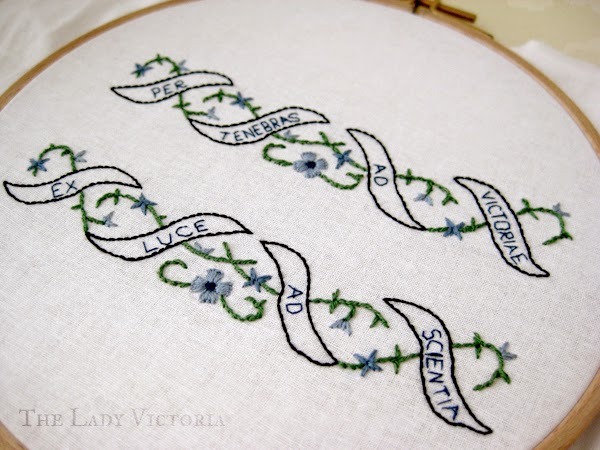 Mostly I just wanted to incorporate a variation of my name in there somewhere! After the embroidery was done I measured and cut the fabric into rectangles, long enough the cover the front of my knee. 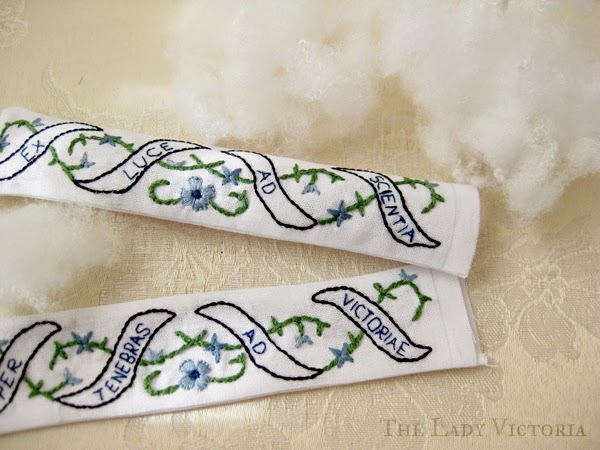 I hand sewed them into a tube, then stuffed them lightly with leftover fiber fill. The stuffing really makes a difference I think. They go from being sad little pieces of fabric to something more sturdy. I didn't have the patience to track down suitable springs to use in the back of the garters, so instead I used some elastic. I simply measured some more squares of cotton and sewed channels into them for the elastic to go through. For the connectors I couldn't find what I wanted in any of my local stores, so I settled on trouser hooks. 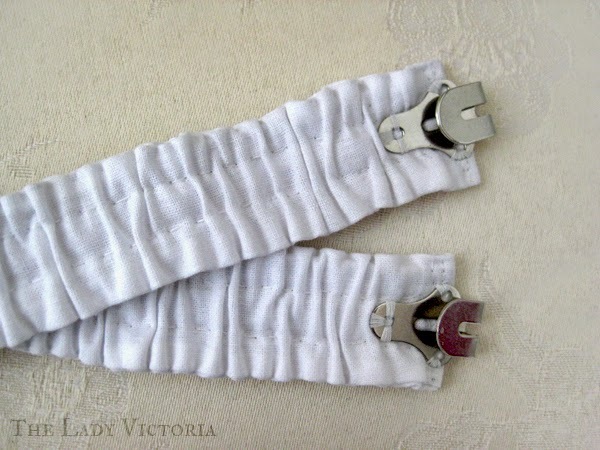 They're far to bulky for the garters, but I can easily snip them off and replace them if I find something more suitable.